I have been following the case of a California doctor who is accused of severely injuring two cyclists on a road this last summer saying that "cyclists frequently traveled down the residential street in Brentwood and that he was 'tired of them.' " This case hits very close to home, as I have been on the receiving end of many people's dangerous driving practices. Reading some of the comments on the article, it brings to my attention that people are very polarized on the subject of road rights for bicycles and cars. "The fact of the matter is that these bicyclists were riding way too fast and were a hazard to everybody on that road." "They are arrogant, ride close to the middle of the right-hand lane on Sunset and won't move to let cars go on their way." "They ride way too fast and hog the road." "The road is for CARS, not bikes. These idiots think they can slow down our roads just because they wear tights that say USPS on it." "Unless you need to bike to work, school or for errands, I think bicyclers belong on a freaking BIKE PATH. Roads are for cars -- get off of them, recreational bicyclers. Go do your little riding in the park and stop annoying the rest of us with your ugly outfits and traffic-slowing, two-wheeling ways." "The bikers were tailgating. They deserve whatever injury they incurred. It is completely their own fault. HA HA"
"The cyclists are at fault. They rode their bikes into a stopped car. Dummies. Don't they teach people in driver's education not to tailgate? What if he had a good reason to slam on his brakes? What if an animal or child ran out in front of him? Don't blame the doctor for these idiots riding into his car." "I ride my bicycle often in Hollywood, obey traffic laws, and have never sworn at anyone while on my bike, unless it was under my breath. I've never flipped anyone off, or not done my best to stay out of the way of cars, especially when they exhibit signs of impatience (which are very easy to detect) often going on the sidewalk to yield my legal, but not prudent, right of way. Yet every time I ride I get honked at, sworn at, flipped off, or endangered by a road rage maneuver, usually the driver cuts their car in front of me quickly at a dangerously close distance. No one has slammed on their brakes yet, but it's probably only a matter of time." "I am not condoning the prior actions of the cyclists. Yes we have all been on the road with that arrogant guy or group in tights who take up the road and gives you the dirtiest look ever (on a nice day) if you say something to them. However they are entitled to the road just as we are in cars. Some of you don't realize that bicycle safety manuals actually says that when in dangerous situations (like a NARROW ROAD) that it is safer to just take up the entire lane. As much as I hate being stuck behind a bike, that does not give me justification to do the rider any harm." "A cyclist can in fact take up the entire road if they so choose. They are equal to a car by law on any road with the exception of a a highway." "Yes a bicyclist might yelll something, but usually it is after being almost run over etc. Bicyclist have every right as automobiles on the streets in California, that is the law"
"It is a fact that a car can brake and decelerate a lot quicker than a bicycle can. Any responsible cyclist should know this and maintain a safe distance from a car, especially on downhills." "Does anyone else find it ironic that some posters are complaining that cyclists slow them down by riding too slow, while others complain that the cyclists are riding too fast? These people have the mentality that anyone who drives slower than them is hogging the road, and anyone who drives faster is a maniac." 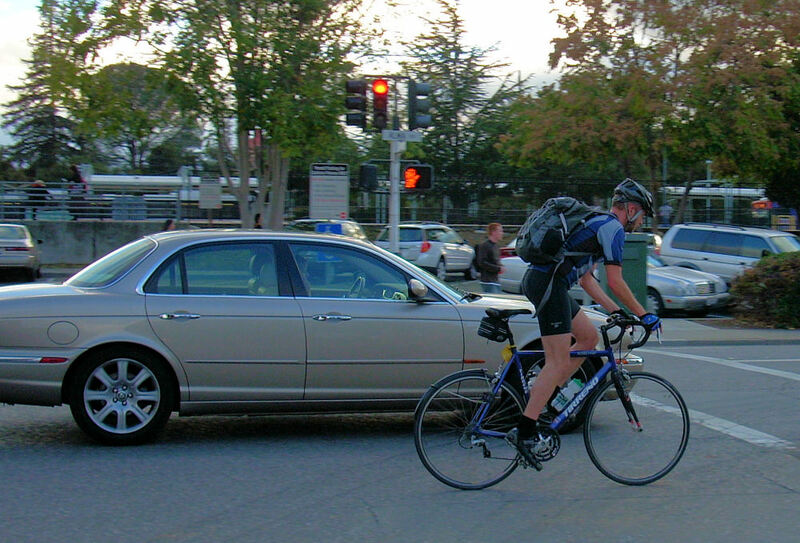 "There are idiot bicyclists, just as there are idiot drivers." "Yeah, I can see the doctor's point. When someone's doing something annoying, or something you perceive as illegal, or even just rude, it's up to you to show them who is boss. Cyclists wearing clothes that are too bright and don't meet your standards? Hook 'em with your BMW and put 'em in the hospital. Kids too noisy playing on your street? Take a baseball bat to them and teach them some manners. Neighbor's dog barking again? Poison it, that'll give you some peace. Motorcyclists getting through rush-hour traffic too easily by lane splitting? Crack your door open and watch 'em go flying. Yes, it's up to us to put these people in their place, so that we can build a better society." "Knowing Chris Thompson, I am sure he did not mean any harm to the cyclists." Before getting into who I think is right or wrong, you can clearly see that many people feel very strongly about this topic, and there are opinions on both sides. Many don't side with what the doctor is accused of doing, but still think that bicycles do not belong on the road. Now, on to what I know. In every state that I know of, bicycles have the same rights as cars do. They are allowed on all roads other than highways and interstates, and are allowed to take any position in the far right hand lane. This means that legally, they are allowed to ride at 3mph anywhere in the right hand lane, even on a 2 lane road. Secondly, no matter what the situation, motor vehicles do not have the right to harm any other vehicle, motorized or otherwise for any reason. Now on to what I think. Anyone who thinks that "the road is for CARS, not bikes" should really take a second and rethink their position. Go check out your laws (Missouri) and you'll see that the road is made for bikes too. Those who believe otherwise form their opinions from ignorance and hate, and do nothing but harm. Also, they are just plain wrong. The law gives bicycles the same rights as cars, but so much hate and prejudice is directed towards them that it amazes me that there are not more cyclists that are assaulted like this. We can disagree on the safety of riding in the middle of the lane as compared to riding on the edge of the road, but the legality and rights of cyclists are indisputable. Whether you agree or disagree, please take a second to think about what I have written here, and please leave a comment. The basis for my overall legal viewpoint is this: if an action being considered for regulation hurts, harms, or damages no individual other than the one performing the action, the legislation should be discarded as unnecessary. These laws are in effect to protect individuals from the irresponsible actions of others. These laws are necessary and helpful as they regulate (somewhat) common actions that can seriously harm other individuals. All of these laws were implemented with good intentions in mind, but the only individuals these actions hurt are the individuals performing them. So, these laws are made to protect people from themselves according to another individual's morals. The state needs to stay away from these laws as this is essentially asserting that the state knows better than the individual. While this may be true in some cases, it is not always true. Since it is not always true, the fairest and least intrusive (it's a free country remember?) course of action is to refrain from legislating these actions. One special case is that of minors. Minors need to be exempted from these liberties as they are not mature enough (usually) to make decisions knowing the full consequences of their actions. Therefore, their actions should be regulated somewhat, but responsibility needs to be place on the parents to ensure the safety of their children (just like it is now).